Try and google any profession or discipline in business, and you’ll no doubt get millions of search results, ranging from the most basic definitions and history of the profession (a la wiki pages), to a litany of vendors and experts doing everything from advertising their offers to providing tips and “how to ” advice. But while the volume of search results might be a bit more frustrating than you might like, the general topic discussed remains relatively consistent. Google “law”, and you get lawyers and law related topics. Google “medicine” and you get medical advice and thinking. Google “golf” and you get golf tips, instruction, and scores. Sure, you get content reflecting different variants of the profession, and even varying depth of discussion, but not different professions altogether. ance management” and watch what you get. Chances are, you might feel like you’re wading through a forest at night without a flashlight. But if you wade into it long enough, you’ll start to see four separate categories of content (and what essentially has emerged over the years as four separate professions) with their own content, messages, thought leaders, followers, and overall “ecosystem” (a bit much for what is really a single and simple, yet very important, business process). You’ll see those who focus on the pure HR discipline, where performance management carries a connotation of employee appraisal systems, compensation, coaching and the myriad of other topics. Most would put in the “human capital” context. You’ll also see those who focus on the metrics and measurement aspect of the business (the importance of measurement, kpi’s, performance reporting and analysis). These results often cater the needs of corporate performance or measurement functions. You will also see some level of strategic dialogue, from strategy mapping to alignment of executive teams and even basic planning frameworks taught in first year b- school. All of this is generally oriented toward strategic planning functions and the executive team themselves. But by far, the most prevalent hits will come from the business intelligence (BI) community, which is most often geared to the IT and sometimes the CFO crowd. For any of us who have spent time in the PM discipline, we know that there is no “one right answer”. All of these professions create value in their own domain. And the discussions you find in each area- be it on blog sites, web sites, or social media, carry very useful content. But they still show up as very different in terms of their focus, content, audience, and even the agenda they are pushing. Ok, but is this such a big deal? Well, lets think about this from the perspective of a client executive trying to implement an EPM platform within their company, and this picture starts to get confusing and frustrating. Not only are they forced to deal with each of these four domains with the vendor community, but they are forced to deal with the very same internal factions and silos within their own Organization. I can’t think of many (actually any) other disciplines that carry this much confusion around roles, processes, and systems within a business. Having to wade through that kind of maze wastes valuable time and energy that could otherwise be spent on implementing a far better and more effective EPM solution. Some of us in the performance management community have made our humble contributions to clear up some of this confusion. For example, we’ve started to see the term BUSINESS performance management used to differentiate it from the appraisal and compensation stuff. Or “portfolio performance management” to describe how PM applies to our investment portfolios. I’ve even seen the term “operational performance management” used to describe how this discipline applies to operating units versus executive groups. But does any of this really help, or does it further confuse things? As if the HR guys aren’t focused on BUSINESS performance management…or that the OPM guys don’t care about EPM or PPM…and that this is all somehow separate from what the “BI folks” focus on— come on!!! My not so humble opinion is that we should drop all these semantic gyrations, and focus more on what we are trying to create collectively. 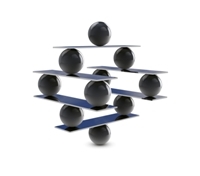 Performance management is an INTEGRATED CORPORATE PROCESS that includes ALL of the above. But until we think about this as one unified discipline, and one unified process, we will never have the kind of substantive impact on the business that we all know is possible (and very likely even bigger than any of us can individually see today). Now there are most certainly organizations out there who do in fact “get it” from an integrated standpoint. But from first hand experience, I can tell you that these companies have fought an uphill battle all the way- one that has only been made more difficult by those inside the profession itself…including many of the current thought leaders in each of these arenas. 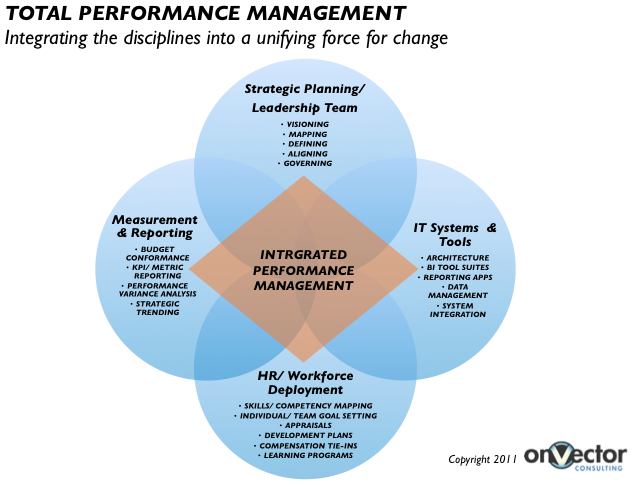 I’d like to see more effort by the collective performance management community…within and across all of these disciplines to align around a more integrated definition of performance management, and a common approach to deploying an integrated performance management platform, rather than four individual solutions. Sure, we’ll bring all these capabilities to the table to enable that…but let’s start viewing these components as pieces of the puzzle rather than each continuing to view theirs separate and distinct solutions. Call me naive if you will, but I think this all starts by stopping all this “silo style” dialogue and begin spending way more time speaking with a common voice and more integrated narrative. I invite some healthy debate and dialogue around this topic, so please forward your thoughts and comments and we’ll see if we don’t make some bigger progress in the months and years ahead. This entry was posted in Business Process Improvement, Change Management, Corporate Performance Management, Customer Service, Enterprise Performance, Performance Management and tagged appraisal systems, BI, BPM, business processes, CEO, CFO, enterprise performance, EPM, HR, IT, OPM, performance management by Bob Champagne. Bookmark the permalink.